And just because they’re under $200 that doesn’t mean they aren’t worth it! This list of telescopes shows that you can get a quality buy for all levels of users for a fraction of the cost. Many of the scopes on the list fall way below that price point and will really fit the bill if you want to look at the stars, planets and Moon. Here are some of the best and why they would be a great fit on your wish list. 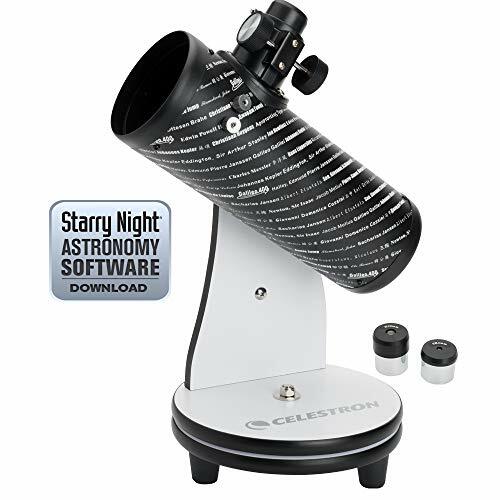 Celestron offers a low cost option for buyers that just want extreme portability with their product, and introduces the Celestron 21024 FirstScope Telescope. The Firstcope series is known for being miniature powerhouses when it comes to astronomy, and with few options to fiddle with are perfect for the beginning user. But the attraction that drives sales to this series is the price and the level of durability, all due to its size. The powerful 76mm aperture reflector optical tube is even stronger than the Observer’s, and will gain you a considerable advantage when looking out in the night sky. This is all done while being about ¼ the size of the original product and weighing a lot less. When moving the tube around on the base it is loose enough to where you don’t have to worry about adding too much pressure. But it is also sturdy enough to stay in place, even if you accidentally hit the top of it. With the two included eyepieces that is about the most customization you will get out of this little telescope, but it will be all you need. Buyers that want to keep things small when it comes to astronomy end up pretty happy with this as a purchasing decision. Returning to the list with a low priced product is Orion, with a design and style that rivals the FirstScope. If you want to get something that will be a great traveling telescope to a first time user, then buying this product will be a real treat. Even with its small portable size, it has a powerful 76mm optic that is built to collect 60% more natural light that the smaller 60mm telescopes. This is the same size as the FirstScope, but with a better light gathering algorithm. 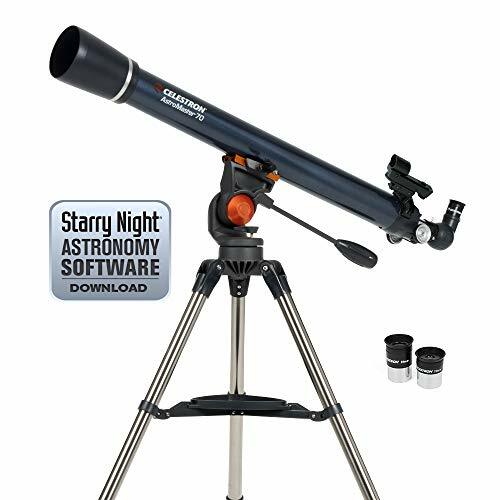 Using this handy little item you can view the finest details of the moon and even see the biggest stars in the solar system. With the included educational materials buyers can find the most popular craters and lunar features on the Moon. The scope in its entirety is only 4 pounds, so expect to be able to use it anywhere you want. Dimensions come out to 8x8x13.5 inches total. Don’t pass this product up if you want great power for a small amount of money. The most expensive item so far but still at the medium price range is the Celestron 127EQ PowerSeeker Telescope that comes in a range of styles. 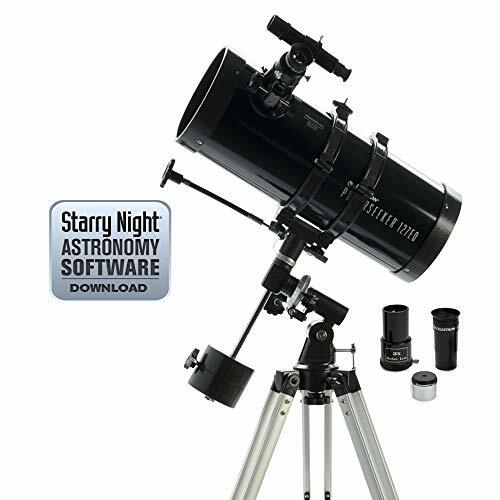 Buyers can choose the 80EQ Refractor, 70EQ Refractor, 60EQ Refractor, 127EQ Newtonian and the 114EQ Newtonian. With these options you can pretty much get whatever you want in terms of power and design. The 3x Barlow lens is a great way to boost the power and comes bundled with the set for free. If the regular focus isn’t enough then you can count on an incredible magnification setup with use of the Barlow lens. The highest aperture on the list up to this point goes to the PowerSeeker, which lives up to its name with a 127mm aperture to play around with. Focal length maxes out at 1000mm, and combining that with the Barlow lens makes this the most powerful telescope on the list up to this point. An accessory tray is included along with an aluminum tripod to keep things in order while you stargaze. Last but not least the German Equatorial Mount works like a dream and is a major selling point with this model. One of the best on the list and probably close to the top, this telescope is all the power you will ever need. 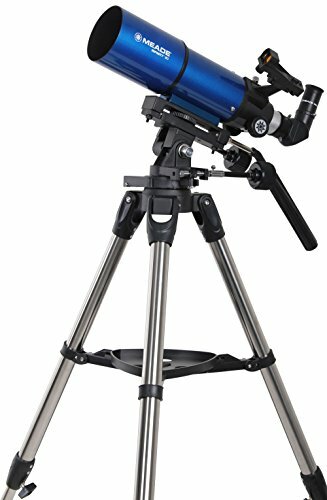 This beautiful blue telescope comes in a variety of styles, much like the last item on the list. It is a high priced model but still below the $200 price range that is required to make this list. Aperture is pretty good with this model at 80mm with a focal length of 400mm. So you’ll get good range on faraway planets and stars, but the real eye candy that is within this scopes power is going to be when it is pointed towards the Moon. Using the low, medium and high magnification eyepieces offers a completely different experience when discovering new things in the galaxy. This doesn’t include the power 2x Barlow lens that doubles the power of each eyepiece. If you tend to have a lot of materials with you while stargazing, then the accessory tray will come in handy. And for those interested in learning more about the stars, an instructional DVD and Astronomical software is included. As another scope that offers a ton of options, the Infinity is a great choice at a low price. 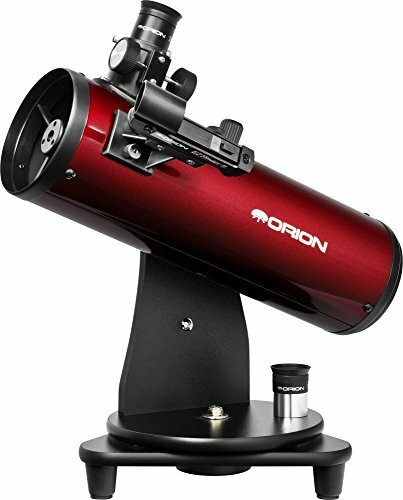 Second to last on the list is the medium priced Orion 10012 SkyScanner 100mm TableTop Reflector Telescope. If you’re looking for a reliable tabletop reflector telescope that will last you for years, then this little portable item will do just the trick. Featuring a powerful 100mm parabolic primary mirror optic this is small but extremely powerful when viewing the stars. Avoiding going the cheap route and using plastic lens, this fully glass lens product will grant you a sharpness that is unavailable on lower tier devices. Combine that with the power of the two 1.25 telescope eyepieces that come in both 20mm and 10mm flavors and you have a very nice setup. Accessories bundled are the infamous Starry Night astronomy software and an EZ Finder II aiming device. It doesn’t take long to get used to all of the features offered, and with the powerful long view but wide angle of the optics you’ll get to see more of the sky than with any other similarly styled telescope. One of the best on the list, this is one telescope that will do more than just sit on your office desk. Saving one of the best for last, the medium priced Celestron 21061 AstroMaster 70AZ Refractor Telescope comes in styles of 70AZ Refractor and 90AZ Refractor. Both offer quite a punch in the power department and come bundled with durable and high quality materials. Setting this up when it first arrives in the box takes minutes, and no tools are required for the entire set up or even the breakdown of the equipment. A StarPointer is permanently mounted to the scope, so you’ll always have a way to center things when needed. For terrestrial and astronomical use you can erect image optics on the fly, and take full advantage of the quick release dovetail attachment. There isn’t anything else like that on the list, so it can be considered a premium feature. The diameter of the optical lens is a nice 2.6 inches, more than enough for long and wide viewing of the galaxy. With a nice hefty weight of 18 pounds and dimensions of 15×5.1×3.9, this will be the center of attention at stargazing parties that you organize. As the last product on the list, it would be perfect okay to call this the best on the list. There’s no better way to get value for your money than with a full size kit rather than just a telescope. That is what Orion decided to do with this low priced product that comes with everything but the kitchen sink. It works well as a complete set whether it is for beginners or intermediates, and is a great gift for kids that want to get started out with astronomy. Using a 60mm telescope the Observer can view the most known planets and starts in the galaxy without a problem. Two fully coated 1.25 eyepieces allows you to get a crisp image every time, even on the busiest of nights. With such a large enhancement in the magnification options buyers will have more to look at in the sky than ever before. 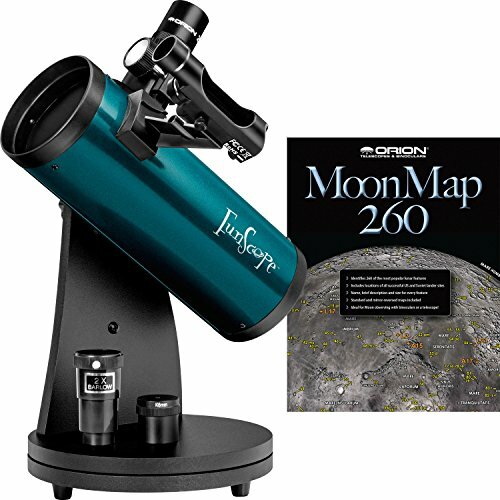 Bundled educational materials include the Orion MoonMap 260, Star target planisphere chart, and the Astronomy Book. This is about all the material that any beginning astronomer will need, and they’ll be busy for weeks with all of the included content and pictures. A great start to the list, the Observer is definitely one of the better choices on the list. Getting close to the end of the list there are some interesting mid-priced scopes that have come out. The Orion 11043 SpaceProbe 3 Altazimuth Reflector Telescope works well as a beginner and intermediate telescope for buyers that want something to last for years. Despite its size it is lightweight and can be set up in a matter of minutes, tripod and all. The powerful 76mm aperture can see storms on other planets, rings on the outside of planets and even the various moons orbiting Jupiter. No matter what direction you move the scope while on the tripod you’ll get a smooth and consistent feeling, never losing track of what you’re following in the sky. The EZ Finder II reflex sight is the perfect way to get the most out of your night out, with the ability to find many objects with the scope that would be harder to find with lesser scopes. Included in the package are two 1.25 inch telescope eyepieces, reflector collimation cap and the Starry Night astronomy software. A deal and then some, this is one telescope that will take more than a week to go through all of the features. These two terms can drive a beginning astronomer crazy while they try to figure out which telescope is better for them. These two types of telescopes are the main ones you want to pay attention to when making a purchase, with a subtle difference that makes your experience change. Refractor telescopes use lenses that use the same type of glass as say regular eyeglasses. Reflector telescopes are mirrors that play off of each other to give you an exact image. So which one is better? Reflector telescopes are judged by their light gathering techniques, since the integrity of the image is entirely based on the mirrors developing a 1:1 image and sending it back to your eyes. The better the light gathering the more accurate the image. Because of the way they’re made, Reflector telescopes are often cheaper than Refractors by a lot. What that means is that you can spend more money on a Reflector with a huge aperture than you would be able to on a competing product. And remember, the bigger the scope the more light it can collect, and in turn the better the image quality for you. Some interesting quirks with this choice is that if you want to use it in the day time you need an erecting eyepiece, a special accessory that allows you to get correct images in the day time. Without it, everything you view will be upside down and probably drive you mad with anger. With all of the mirrors being used in this setup, buyers have to dig into the manual and learn how to collimate every once in a while. Collimation is how you align a telescope mirror for a Reflector telescope. With all of these sensitive parts, it isn’t uncommon for these types of telescopes to be a bit more delicate when it comes to wear and tear over the years. Refractor telescopes are a lot different, and have more aggressive light gathering techniques that bend the light. This method projects the image back to the eyepiece, where you’ll get a magnified version of it with the correct conditions. The benefits of these types of scopes is that they will be lightweight and small, while still providing a more powerful and richer image than Reflector telescopes. Take a look on the list and compare the sizes of a Refractor telescope to the others and you will get a good idea of the differences. These benefits come with a price tag, and they tend to cost more the larger they get. If you have the money it is well worth it, as some Refractor telescopes can be seen as high end purchases due to their enormous amount of features. There is also no adjusting when it comes to these types of scopes, leaving you free to just worry about general cleaning over the course of its lifespan. With a lot less prep work to worry about than with a Reflector telescope, a Refractor telescope is the perfect set I and forget it product when it comes to astronomy. It also works perfect for daytime watching without any type of extra accessory. In the end you’ll have to decide what makes the better purchase for you. Each product has its pros and cons, so just weigh them carefully and make an educated choice. Absolutely! Deciding whether to buy a telescope based on the software and books it comes bundled with is a perfectly acceptable buying tactic. Since many of the products on the list mimic one another in terms of power and some features, sometimes the deciding factor is whether or not it has the materials included that will welcome a new user to the world of astronomy. Even if it doesn’t have a beginner book, including something like a chart to help you navigate and find stars is more than worth it. With the billions and billions of things you can find in the galaxy, having a starting point can make all the difference in the world. If a telescope comes with nothing but an instruction manual, then what are you supposed to do? That is why some of the sets on the list come with a DVD. In the case of Orion, they pack up their product with multiple sources of information. Orion sells a lot of books on the subject of space, and if you go through their catalogue you’ll see that one of their top selling books is the same one they include with their telescopes. That is an awesome deal, and one that can really change the tide of a purchase. That concludes what has been an interesting list showing that breaking the bank is not always necessary when getting a fantastic telescope. With some key differences explained and a lot of pros listed, you’ll be able to come to a sound buying decision when it counts.